This was a fascinating look at new urban protestant congregations by the New York Times. And it is not a hit piece. Usually reading the NYT on churches is about cultural ridicule. The fact that it isn’t should give pause (Hey, why are these guys who are usually completely against the church actually nice to these groups? ), but I’ll let that string go because the report is just good data. The mural painted on the side of a building in the Deep Ellum warehouse district here is intentionally vague, simply showing a faceless man in a suit holding an umbrella over the words “Life in Deep Ellum.” Inside there are the trappings of a revitalization project, including an art gallery, a yoga studio and a business incubator, sharing the building with a coffee shop and a performance space. But it is, in fact, a church. There are several deep questions embedded in there: 1) What exactly is a/the church? 2) What would it mean to reinvent a church? 3) What has the church been historically and what roll does space play in that? A key quote from later betrays some motivations or implied answers to those questions by the people interviewed. The first thing I would say is that “wanting your own thing” in religion is a notoriously bad idea. Being sinners, getting what we want is almost the definition of trouble. The Christian proclamation is that God sent His son Jesus for you. If you are looking for your own thing what you end up is alone and lost because God is not naturally found in your heart or inside. God comes to us from the outside. What I’d say is that these guys are by and large a false church peddling an emotional experience (that is the word he uses!) What that eventually leads to exhausted folks far from the true path. We are not Vulcans that purge all emotion, but the emotions need to be formed under the Word to feel rightly. They are not a path themselves. There have been a string of national and then local tragedies. Unfortunately this sermon is something of a continuation of one just two weeks ago. I never meant for there to be a continuation, but events experienced called for it. In the middle of joyful events – like Christmas – as Simeon will say to Mary, there are swords to the heart. I reviewed that sermon from Dec 16th a little, and I think it is the proper response for an individual. 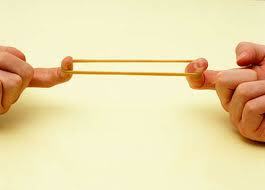 And one individual, ourselves, is all we can actually control (the fruit of the spirit of self-control – Gal 5:23). But that sermon left something unexplained or unexamined. What about the collective us? We ask questions like “what have we become?” And that question comes off the lips of a man who in no way has become what he is pondering, yet he supplies the “we”. It is another form of the “why?” question – why do such atrocities happen, one that actual betrays a developed conscience in that responsibility is placed on the right people. If we are asking “why me”, that individual question is not something that God tends to answer. But, if we are asking collectively, “why us” or “what have we become”, then I believe God has given us an answer, through St. Paul in Romans 1. The first sin is forgetting or abandoning God. A trespass of the first commandment. From that trespass come all the others. Sin is both the cause of our troubles and the judgment. When we abandon God, He hands us over to our sins. When you are looking at a larger culture, that can get very evil very quickly. And if Paul is right (which I believe he is), the end point of that isn’t just sins but a collective culture that gives approval to their practice (Rom 1:32). Why have we become a greedy, violent, lustful, callous, warlike and spiritually barren people? Because we have collectively abandoned the fear of God. And He has handed us collectively over to the rot of our collective culture. What is the gospel? First, Simeon’s song. My eyes have seen your salvation/That you have prepared in the presence of all peoples/A light for revelation to the Gentiles/And the glory of your people Israel. 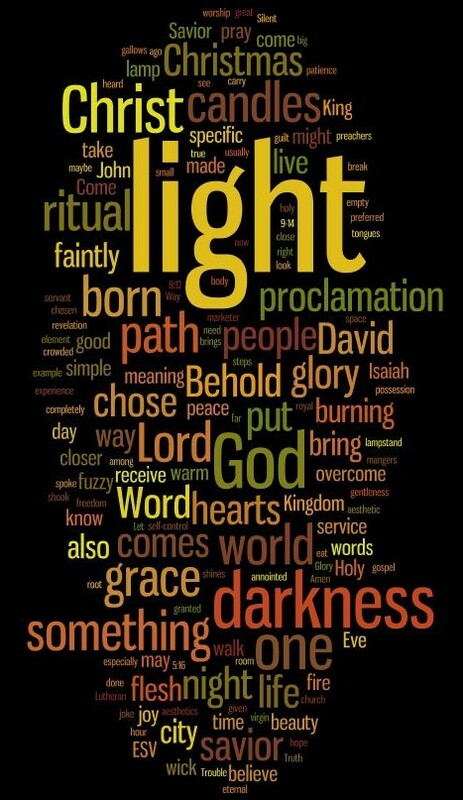 God has sent a savior in Jesus Christ and we have seen his light. God doesn’t make false promises, and today is still a day of grace. Repent, for the Kingdom of God is near. Second, our hope is not in this flesh or this collective people. Our hope is in the resurrection and the New Jerusalem. The angel of the LORD encamps around those who fear him, and delivers them (Psalm 34:7). It’s the shortest season in the church year, 12 days, from Christmas day until Epiphany. But within that short season there are some interesting minor commemorations. Dec 26th – The Feast Day of St. Stephen, protomartyr or the first martyr. Luke gives him two chapters, Acts 6:8 – 8:3 and maybe a little of the psychology that lead to St. Paul. 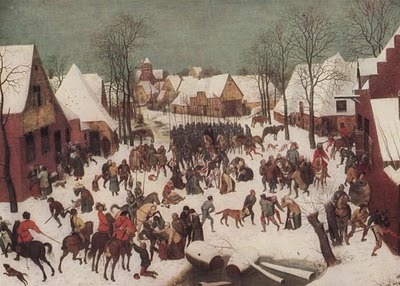 Dec 28th – Holy Innocents, Martyrs The picture above is Bruegel’s depiction of the event. I always appreciated how Bruegel could bring biblical events to Flemish towns. In the midst of the landscapes that we know all too well, something profound takes place. There has always been for me a profound lesson in that. Here, these stories are timeless, because they tell us something about ourselves and the Truth. And now they are yours. You are their keepers and teachers and livers. Are you Stephen who inspires Paul, or are you Herod? How will you keep them? That is a lot of blood. The Christ child came, was incarnated, in flesh and blood. And blood in this world gets spilled and spent. The question to you on this Childermas, is how do you spill yours? As Martyrs and witnesses or to make full the sin? For most of us that is a metaphorical question. We won’t be martyrs. 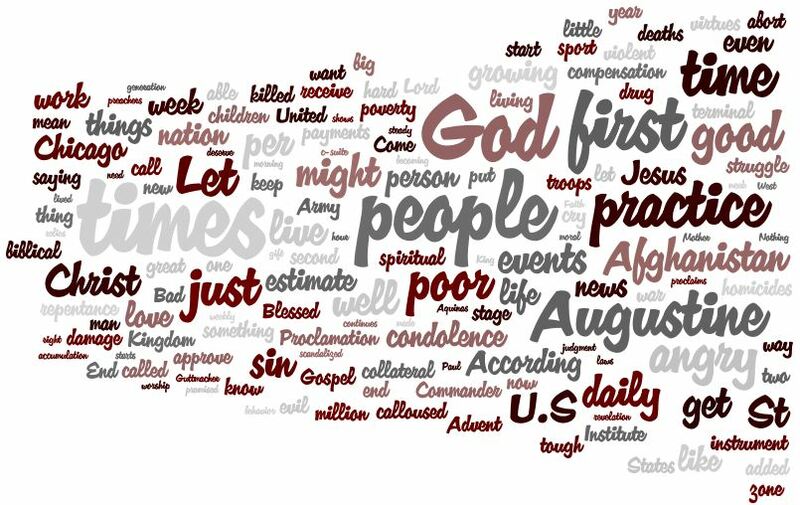 But who are our saints that the Augsburg Confession says, “we may imitate their faith and good works according to our calling.” How is your blood spent, or who is your blood? A prize goes to the first person who is able to identify the hymns referenced in the sermon. As to the Sermon, proclamation gives way to praise, especially when the mystery is so great. I reread this sermon. In my head it is about as tight a presentation of the gospel as I’ve given. But I am also pretty sure it was only able to be heard by those who had ears already. 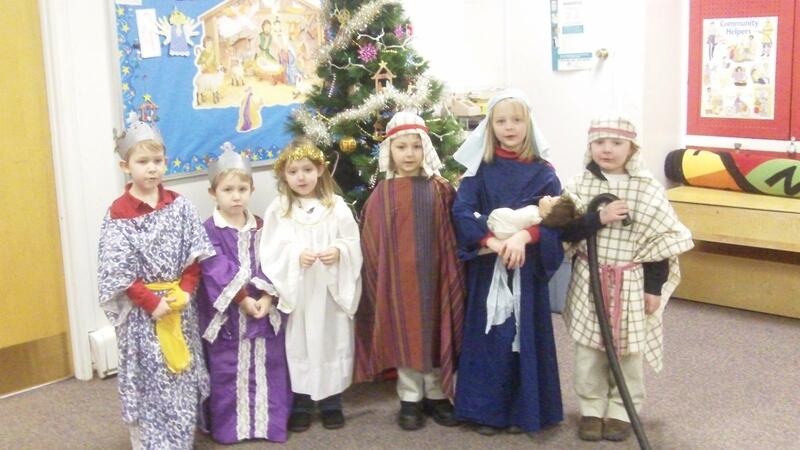 This is from our Children’s Pageant this year. Click on any of the photos to be taken to a slideshow version. If any parents want a snapshot, you know where to contact me. Our Church took part in this for the 4th year. This year I submitted my “shipping fees” online, printed out the bar code for the box and taped it on. The benefit was said to be a note on where the boxes went. Behold, this evening I got two notes saying where those boxes ended up. Box 1 was sent to Central Asia while Box 2 went to Malawi. First Things publishes an article about the Texas district of the LC-MS mission strategy. That strategy is more or less incubated and first tested in LINC-Houston which I went to observe. That is the strategy that we’ve imported and are using with LINC-Rochester. Necessity is the mother of invention. St. Augustine, in a sermon long ago, said: Bad times, hard times, this is what people keep saying; but let us live well, and times shall be good. We are the times: Such as we are, such are the times. We have been hearing lots of calls for action and change in the wake of another school shooting. But most of the calls that I’ve heard have been forms of taking something away from the other guy. Take the guns away. Lock up or medicate the mentally off. Everybody thinking they are safely on the other side of some bright moral line. Nobody looking at the culture that we collectively produce and allow. Looking at that would put us all on the same side of that moral line. We might have to repent i.e. change. But, such as we are, such are the times. Until we are willing to really change, to live well as Augustine would define that, things like Newtown will continue to happen. We are simply staring in a mirror. And the deepest gospel, in the middle of this Advent season, is Come Lord Jesus. That is the only thing that finally changes the image in the mirror. On the church. Point 1: Christ instituted a church. You (normally) don’t get Christ without a church. And If you don’t get Christ, you are still in your sins. Point 2: I’m a little sick and grumpy today, but I’ve reached my fullness of things like this. I’m tired of ever so cool people making their hay beating up on mother church. An atheist or one outside can do what they like. There are internal conversations and knowing laughs about the church in the way that siblings talk about mother but rarely in her presence. But for ministers to go bad mouthing Her in public, It’s a “yo momma” joke without the joke part. This guy explains the connection very well. Christmas Songs: I inherited a tradition from my brother. Cleaning out his place I think we found a Christmas album for every year. Imagine a 6’6″ guy with a beard listening to some Celtic sprite sing Ave Maria. He liked Carols and Hymns vs. songs, but you could tell that he was reaching in the later years; getting tough to find singers cutting albums with such tracks. Out and about I caught an interview on NPR. I never caught the names, but I’m willing to bet its one of these: Tracey Thorn 1, Tracey Thorn 2, Tracey Thorn 3. The part that caught me in the interview was talking about what a studio expected in a new “Christmas Song”. The list was roughly: no mention of the word Christmas, no religious images, major key, upbeat tones and rhythms, 2:30, preferably with either a mention of Santa, snow, reindeer, or some other “traditional” element. (The artist was trespassing several, although I don’t think the religious ones. We know what the third rail is). Yes, I’m religious, but come on: 1) It is Christmas and 2) you don’t get something White Christmas with the original first verse (“in Beverly Hills, LA…”) or Have Yourself a Merry Little Christmas if everything deep and meaningful has been drained out of the time. It is almost enough to make you as grumpy as this guy.